I establish a long-term vision, and work strategically toward that vision. It is this long-term vision that allows a WPA to set strategic priorities that balance the often competing needs of stakeholders to ensure the program is always working toward its core mission. For example, a key part of our online writing center’s mission is to reach the “non-traditional” students that research shows online instruction is so crucial for. But demand, surprisingly, has been low in recent semesters. As the coordinator of the program, I set aside time each day to remedy this gap, reaching out to programs that serve students most likely to benefit from online instruction, developing and distributing promotional materials, and strategizing with our online staff about improving our outreach efforts. When I became Harrington College of Design’s first WPA, we were faced with a problem that I soon learned could only be solved via collaboration: Employers had been expressing that our graduates were fabulous designers, but poor writers. Drawing from research Writing Across the Curriculum, I offered instructors, program heads, and the higher learning commission a proposal to develop our first WAC program—a proposal that could only be put into practice with the collaboration of all stakeholders. To that end, we began weekly meetings to develop together a program that balanced the needs of students, the workload of instructors, high standards through a strong assessment plan, and our modest budget. Through this process, and through my work in mentoring instructors both individually and in all-staff workshops as well as developing instructional materials, we were able to develop a program with wide buy-in across campus—this at an art school where previously writing was almost never assigned outside of basic and first-year writing. I serve as a knowledgeable, invested advocate for instructors, students, the program, and the university more broadly. During my third year of PhD study, I was appointed through a competitive process to serve as the assistant director of our intermediate writing program atUW-Madison. It was my responsibility—in partnership with the director—to prioritize students’ fair and equitable treatment, ensure that students’ experiences meet the high standards of the program and university, promote a healthy enrollment of students well-informed about the goals and content of those programs, and—crucially—to provide instructors with strong institutional support and the opportunity to grow as thoughtful and informed educators. One way I aimed to provide that support was through the development of the program’s first handbook and companion website which housed both logistical support as well a strong foundation of pedagogical scholarship, examples, and best practices. In addition to observing courses and serving as a point-person for students enrolled in the program, we developed research-based, interactive workshops that responded to the interests of the program’s instructors, including service learning, multimodal instruction, contract grading, and managing group projects. Ultimately, we created an environment in which both instructors and students felt empowered to do their best work. I approach assessment as scholarship. Envisioning my work as a WPA as scholarly work ensures strong assessment practices that met the criteria for RAD research (replicable, agreeable, and data-supported research) which both provide important data about the performance of the program and help to build knowledge in the field more broadly. As the coordinator of UW-Madison’s online writing center, I build assessment into the everyday work of the program. Our student sign-up forms for email and Skype instruction, for example, collect and automatically aggregate data about who is using these services, when, and how often; we also regularly collect student feedback after sessions with an instructor and during a Spring performance review push. We use these data to shape the structure of and long-term goals for these programs. I find administrative work exciting and personally fulfilling. I love this work because it combines the joys of teaching, through professional development, and the exhilaration of research, through strong assessment. Though administrative work is demanding, I genuinely enjoy collaborating with my colleagues, crafting a long-term vision, and strategizing with partners across campus to make things happen. Making positive change happen for students, my colleagues, and our department have been some of the most exhilarating experiences of my career. 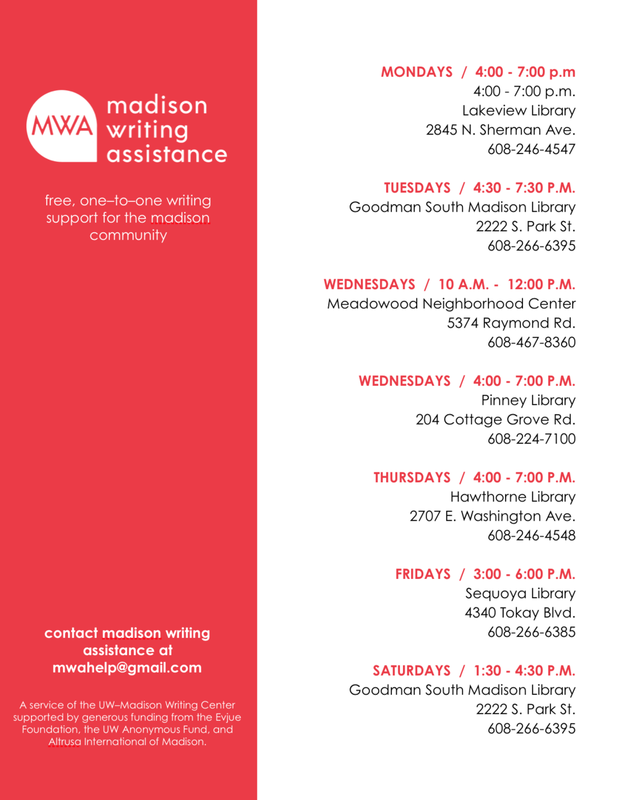 I was also able to re-design the writing center's logo, website, and public-facing materials as well as the logo and website for Madison Writing Assistance and our Writing Fellows program. Helped manage administrative tasks like scheduling, updating and making documents available, sending out emails, developing and managing the program website, etc. I was able to work with both Christa Olson and Mary Fiorenza. The relationship with the director is really collaborative and the director works hard not only to run the program but also to provide an educational experience for the AD. It’s a really incredible--and I think rare experience. I cannot speak highly enough of how important this work has been to both my professional and intellectual development. It requires a totally different mode of thinking--thinking as an administrator and that’s really a rare and special experience to get in grad school. When I arrived at Harrington College Design as an adjunct instructor with an M.A. in American Literature, the college's writing courses were housed under the foundations department. My second year, I was casually asked how we might make better writers of our graduates, as employers had been expressing concerns. Our graduates were fabulous designers, but poor writers. A trained researcher, I came back to the director of foundations with a 20 page research report on the virtues of writing across the curriculum which he then passed on to the university president. Soon after, I was invited to develop and implement this program. Though I continued to teach up to five courses at a time, as Harrington’s first Writing Program Administrator I developed our WAC and writing program and its accreditation materials, authored both the faculty and student writing across the curriculum handbooks, held faculty-wide and smaller-scale workshops on WAC and the teaching of writing, provided individualized faculty mentorship, and worked with e-portfolio vendors and the Higher Learning Commission to institutionalize writing across the curriculum. Working with with the director of academic services and faculty caucuses, I likewise helped develop our academically-focused bridge program and write our college-wide plagiarism policy. Finally, because many instructors still employed a current-traditional approach to basic writing, I went on to design theoretically-consistent basic writing courses for the college. Through all of this, I continued in my commitment as to serving a diverse and often non-traditional student body who required significant care, time, and attention. I left this incredibly fulfilling work only because I knew that for this to become my career, I’d need the intellectual and professional training that UW-Madison was especially poised to provide. As a mentor to three young women in the undergraduate research scholar program, I invite undergraduates to participate in my dissertation research. I treat students' participation in this program not simply as supporting the labor of research, but as an independent study in qualitative research methods. After taking their IRB training, these young researchers begin by reading and meeting with me to discuss scholarly essays on qualitative research methods, focusing on ethnography and literacy history interviews. After transcribing and reflecting on two interviews from my field research, these scholars read two essays on grounded theory data analysis and meet with me to discuss the work of coding. Scholars then code these two interviews and develop one or more theoretical codes which make an original theoretical contribution to my dissertation research (for which they are credited). Pictured right is Chloe Gehl presenting on this work UW Madison Undergraduate Research Symposium. As Kate Vieira's research assistant, I undertook work on several projects. I began by developing the website for Dr. Vieira's second book Writing for Love and Money. In this work, I developed the website, overview video, as well as the graphic design and SEO optimization. My next project was to review the manuscript for Dr. Vieira's first book, American By Paper: How Documents Matter in Immigrant Literacies for logic of argument and factual correctness. Dr. Vieira also tasked me with reviewing and correcting the in-text and reference page citations for the manuscript and several articles both of hers and for the issue of Literacy in Composition Studies she guest edited. Finally, I helped to prepare the materials for her successful tenure review. For one semester, I served as the Assistant Undergraduate Advisor in the English Department. It was an honor to receive this appointment and work under Dr. David Anthony, the then-head of the Undergraduate Program in English. In this position, I advised students in their course of study and assisted Dr. Anthony in administrative duties.